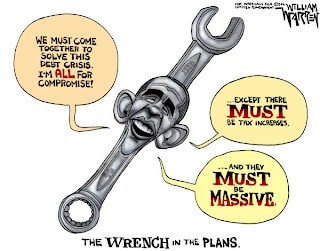 ARRA News Service: The Wrench In the Plans - Obama! The Wrench In the Plans - Obama! Senate will vote on the nomination of Paul A. Engelmayer to be United States District Judge for the Southern District of New York. Following that, there will be a voice vote on the nomination of Ramona Villagomez Manglona to be Judge for the District Court for the Northern Mariana Islands. Then Senate resume consideration of S. 1323, the vehicle for Senate Majority Leader Harry Reid’s (D-NV) debt limit proposal. Reid filed his plan as an amendment to the bill and has filled the amendment tree, preventing further amendment. Reid continues to be a major stumbling block whereas Obama is the "Wrench in the plans" for any debt ceiling plans. House Speaker Boehner and other Republicans are moving forward with another plan since the Senate tabled and refused to debate the bipartisan House "Cut, Cap, and Balance" bill. Senate Republican Leader Mitch McConnell, “Last night the President rejected not just the only proposal that has passed either house of Congress, he rejected the only plan the Democrats have proposed as well – a plan that would increase the debt limit without raising taxes. Just a few days ahead of a potential default, the President announced that he’s the only person in Washington still calling for a massive tax hike, even as his party has dropped their own demands for what we know will make the current unemployment situation even worse. “In short, the President is now clinging to two things we all know Congress can’t support: a massive tax hike and the biggest debt-limit increase in history aimed, in his own words, at getting him past the next election. As Speaker Boehner said last night, that’s just not going to happen. There’s bipartisan opposition to it in Congress. So it was deeply irresponsible in my view for the President of the United States to present the American people with a false choice last night between tax hikes and default. The real choice is this: a bill that can get us past this moment of crisis, cuts Washington spending, and actually get through Congress, or one that can’t. Republicans have offered the only proposal that attempts to get at the root of the problem — and which actually has a chance of getting to the President’s desk. Bill Wilson, President, Americans For Limited Government, "Credit rating agencies Moody’s, S&P, and Fitch have explicitly warned that if Congress does not enact a fiscal consolidation plan totaling at least $4 trillion over the next ten years, the nation’s Triple-A credit rating will be downgraded." In other comments he said, "Washington is getting caught up in meeting Obama's arbitrary August 2nd deadline for increasing the debt ceiling, and is therefore not focused on putting a proposal on the table that would actually preserve the nation's Triple-A credit rating. Now, the metric being used is whether a proposal can pass, not whether it is sufficient to set the nation on a fiscally sustainable path." Doug Patton notes: "[M]any Americans still seem perplexed that after two-and-a-half years, Barack Obama is a walking contradiction. He cannot seem to lead; he can only follow and dictate. He has no policies, only vague concepts and Marxist ideology. He starts wars and calls them something else. He simultaneously makes Congress responsible and yet irrelevant. He refuses to be held accountable for anything." He also added, "House Speaker John Boehner has said that dealing with this president is like negotiating with a bowl of Jell-O. That is because he has no intention of cutting spending. Barack Obama’s inclination is to raise taxes and spend more money, period. Ronald Reagan once compared the federal government to a newborn baby: an insatiable appetite at one end and no sense of responsibility at the other. That, in a nutshell, is Barack Obama." Mike Brownfield responded, "Americans tuning in last night to watch President Barack Obama’s prime-time address from the East Room of the White House might have thought they stumbled upon yet another re-run from the networks. Instead of hearing news that Washington finally broke the debt ceiling stalemate, viewers were treated to more of the same from their President. He still had no plan for dealing with government overspending and over-borrowing, and he repeated his never-ending call for tax hikes." Tags: Washington. D.C., Barack Obama, speech, Debt Ceiling, Obama, William Waren, Political Cartoons, Taxes To share or post to your site, click on "Post Link". Please mention / link to the ARRA News Service. Thanks!